Karl Barth is widely considered the greatest theologian of the Twentieth Century, exerting a major influence in almost every area of theological thought in both Reformation and Roman Catholic traditions. Ecclesial Mediation in Karl Barth deals with one of the most important and controversial themes in Barth's theology, the relation between divine and human action. 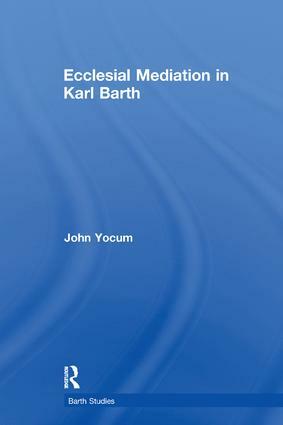 John Yocum argues that Barth's late rejection of the concept of sacrament, explicated in the final volume of his Church Dogmatics, is not only at odds with his account of the nature and importance of sacraments presented earlier in the Church Dogmatics but subverts important elements of his theology as a whole especially the mediation of divine grace in preaching and the Bible. Bringing Barth into fruitful dialogue with Yves Congar, Yocum contends that the notion of sacrament is crucial to an account of the divine-human relation that respects the character of both agents. Contents: Introduction; 'The doctrine of the word of God': the sacramental area of the Church; The doctrine of God: knowledge of God, election and covenant as foundational themes; History, concursus, prayer and the role of angels; Ecclesial mediation in Church Dogmatics IV/1-3; The Baptism fragment; Conclusion; Bibliography; Indexes. The work of Barth is central to the history of modern western theology and remains a major voice in contemporary constructive theology. His writings have been the subject of intensive scrutiny and re-evaluation over the past two decades, notably on the part of English-language Barth scholars who have often been at the forefront of fresh interpretation and creative appropriation of his theology. Study of Barth, both by graduate students and by established scholars, is a significant enterprise; literature on him and conferences devoted to his work abound; the Karl Barth Archive in Switzerland and the Center for Barth Studies at Princeton give institutional profile to these interests. Barth's work is also considered by many to be a significant resource for the intellectual life of the churches. Drawing from the wide pool of Barth scholarship, and including translations of Barth's works, this series aims to function as a means by which writing on Barth, of the highest scholarly calibre, can find publication. The series builds upon and furthers the interest in Barth's work in the theological academy and the church.